ProArgi-9 Plus is Synergy’s top selling product and the cornerstone of any nutritional regimen. One serving contains 5,000 mg (5 grams) of elemental pharmaceutical grade l-arginine. Often referred to as the ‘miracle molecule’, l-arginine has potent health-enhancing properties. High Desert Heart Institute found very compelling positive results including the potential to reverse heart disease! See the full results here. There are also many medical publications that have documented the benefits of l-arginine use. Click here to read more. L-arginine benefits the body in a myriad of ways. It stimulates the production of nitric oxide in the body….to promote anti-aging properties, sports performance, enhance sexual performance, and boost the immune system. We can’t ignore the power of arginine any longer! ProArgi-9 Plus was formulated in collaboration with leading l-arginine researchers such as Dr. Joe Joseph Prendergast and other cardiovascular specialists who have conducted pioneering research in the proper application of l-arginine in promoting cardiovascular health. These experts have helped create the best l-arginine product on the market. L-arginine also enhances health in a number of other ways. It improves immune function, stimulates the release of human growth hormone (HGH), may boost energy levels, helps to build muscle, and reduces adipose tissue body fat. 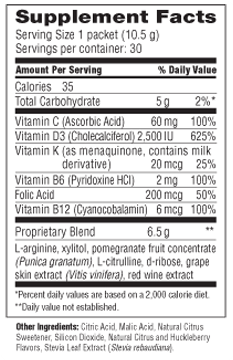 ProArgi-9 Plus now comes in 3 flavors: Citrus Berry, Mixed Berry and Grape. 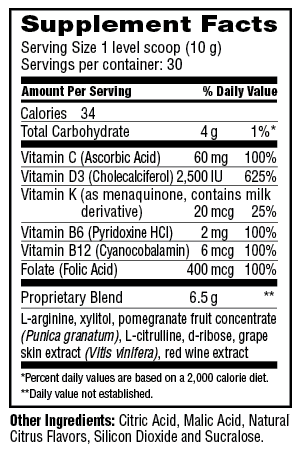 All have the same powerful active ingredients but have different forms of sweetening, like monk fruit or Xylitol (label information below). These and other powerful benefits were documented in a recently completed at the High Desert Heart Institute. Among them is evidence that shows the potential for a reversal of heart disease! Listen to the recorded conference call sharing the studies’ preliminary results publicly for the first time. Joe Joseph Prendergast, MD, is a distinguished certified physician whose advanced research and experience has contributed significantly to Synergy as well as to the medical and scientific fields as a whole. In addition to his role as a practicing physician for over 35 years, Dr. Joe is an accomplished scientist, researcher, and humanist. His research regarding l-arginine contributed to the development of Synergy’s signature product, ProArgi-9 Plus. • <1% admissions in 17 years! In part due to his use of l-arginine in his clinic, Dr. Joe has a remarkable record of less than 1% patient hospital admissions in 17 years including heart attack or stroke. He has received many awards including “Father of the Year” in 2008 from the American Diabetes Association and the Father’s Day Council of Silicon Valley and a Certificate of Recognition in 2005 from the American Medical Association for demonstrating outstanding commitment to eliminating health care disparities in the area of access. Dr. Joe is board-certified in internal medicine as well as endocrinology and metabolism. He graduated from Wayne State University in Detroit, Michigan, completed a fellowship in endocrinology and metabolism at Henry Ford Hospital in Detroit, and fulfilled his research fellowship at the University of California, San Francisco. He has served on many prestigious local and national committees and review panels including the American Board of Internal Medicine, the State of California Legislative Task Force on Diabetes and Obesity, and the American Association of Clinical Endocrinologists. Among his many positions, Dr. Joe has served as an Associate Clinical Professor of the Department of Medicine at the University of California Medical Center and is currently a staff physician at Stanford. Mix 1 serving (1 scoop providing 5 g elemental L-arginine) with 4-8 oz. water (depending on individual taste). Stir to dissolve. If water is very cold, mixture will take about 1 minute to dissolve. One serving (1 scoop) may be taken twice per day. My wife is now 53 yrs old and is a chronic MS (Multiple Sclirosis) patient. Since I came to know of ProArgi9+ I am very curious to use this supplement on my wife to boost up the blood flow in her Central Nrvous System so that the scars and damaged mylien sheaths can be repaird. Will this be possible for MS patients ? Do you have any testimonials to share ? I am based out of Bangalore, India. These supplements are not available in India. Hence let me know the closest distributor for purchasing ProArgi9+. Thanks for your question. Unfortunately there are restrictions based on individual country import laws. We are not yet distributing in India. We don’t get ProArgi-9 plus in India and doctors do not prescribe it either. I am taking medication for suspected CAD for a couple of weeks now and the medical practitioners here are not very forthcoming about throwing more light of using l-arginine along with other medications. Would someone be able to help me with this. I could give more details of medication am using if required. Thanks in advance. I’m glad you are looking into ProArgi-9+ for your CAD. It can definitely help. First off, I’m not aware of the product being available directly in any part of India yet. I’m not sure how you are planning on ordering the product but if you email me directly at admin@healthtechmall.com we can talk about that more. Second, as I am not a doctor I cannot speak about prescriptions. I will say this though. I am not aware of any contraindications with ProArgi-9+ at this time. It is a natural compound that supports the bodies ability to naturally heal itself. It is not like medications in this way. It is more like taking a vitamin in comparison. What I have seen though is when you start taking the product and have improvements in your condition, your need for the drugs will be reduced. Working with your doctor to track this improvement so modifications to your medication levels can be done is important. When all goes well you will be off your medications be your condition has improved so much that you no longer need them. I wish you well and look forward to hearing from you directly. I’m wondering about discontinuing my cholesterol medication and using proargi-9 plus in the one serving packet form. I don’t see this form of proargi on your website? I need to been convinced and reassured at the same time. I don’t like drugs that cause reactions and complications. I have Osteoperosis also with mildly low vitamin D rate. Stacey – Thanks for your great question. We cannot give you advice to discontinue use of medication prescribed by a doctor. We do however encourage you to make the decision with your doctor and for yourself based on information you can find here. The clinical trial results of the ProArgi9 Plus are clear in providing a direct benefit (see study info here). It is PROVEN to improve the cholesterol profile (40% decrease in triglycerides – 18% increase in HDL). It was also PROVEN to increase Vitamin D levels by 183% !! With these results, you can feel confident you will have very positive benefits from using the product. I can also tell you that doctors with a wholistic approach will tell you it is not the cholesterol number that is the main factor but rather the “stickyness” of that cholesterol that is the issue. Common prescriptions work to reduce the cholesterol amount and not it’s sticky factors. This can help but is not the root cause. ProArgi9 Plus is formulated to address the root causes of heart disease in their fundamental form. It sustains the body to be healthy naturally. As for the single serving packaging, I’d be happy to make that item available to you. Please just me know and I’ll add it to the cart.